In our Institute class this evening we are studying Joseph Smith – Matthew from the Pearl of Great Price. This is the chapter that foretells many of the events of the last days. Of course, this is Joseph Smith’s inspired version or re-translation of Matthew chapter 24. The prophet made more corrections to Matthew 24 than to any other chapter in the New Testament. I think that tells us something about the importance of the contents therein. The last days are a topic of great interest to many people of many faiths. I know this because it is a common search term used by those who find and visit my blog. It is a topic about which I am extremely interested and always have been. As more and more signs of the times are fulfilled and some to a greater measure than ever before, we desire to know when the Lord will return. We wonder how long things can continue like this. For this essay, I would like to focus on verses 22 to 37 of Joseph Smith – Matthew. These are the verses that deal with the prophecies about the end of the world. The earlier verses in the chapter are about the prophesied events of the destruction of Jerusalem in the days shortly after the death of the Savior. Note that verses 22 to 37 deal with the end of the world, not the end of the earth, which is not until after the millennium is over. The end of the world is the end of wickedness. 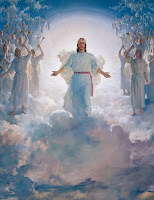 That is prophesied to come about with the return of the Savior which will usher in the millennium. Until the Savior returns the rule of wickedness in the world will only increase and get worse. Today, the persecution of those who believe in the Savior and follow his teachings is fairly mild. However, it will increase until the disciples of Christ cry unto the Lord for relief from the wickedness. There are many signs of the last days which I will not consider here. For example, the house of Israel must be gathered from the four corners of the earth. The gospel of the kingdom must be preached in all the world. There shall be famines and pestilences and earthquakes in diverse places. There shall be wars and rumors of wars among all nations. There shall be false Christs and false prophets that even the very elect shall be deceived. I have written previously about the sun being darkened and the moon not giving her light. I have also written about the stars falling from heaven and the powers of heaven being shaken as well as the sign of the Son of Man in heaven. The verse I want to concentrate on is this: “And again, because iniquity shall abound, the love of men shall wax cold; but he that shall not be overcome, the same shall be saved.” Iniquity is wickedness or sin. “I saw men hunting the lives of their own sons, and brother murdering brother, women killing their own daughters, and daughters seeking the lives of their mothers. I saw armies arrayed against armies. I saw blood, desolation, fires. The Son of Man has said that the mother shall be against the daughter, and the daughter against the mother. These things are at our doors. They will follow the Saints of God from city to city. Satan will rage, and the spirit of the devil is now enraged” (Joseph Smith, History of the Church, 3:391). “I prophesy, in the name of the Lord God of Israel, anguish and wrath and tribulation and the withdrawing of the Spirit of God from the earth await this generation, until they are visited with utter desolation. This generation is as corrupt as the generation of the Jews that crucified Christ; and if He were here to-day, and should preach the same doctrine He did then, they would put Him to death” (Teachings of the Prophet Joseph Smith, 328). Although some might say that the Civil War fulfilled some of the words of these prophecies, I believe that we have not yet arrived at the day when the terrible scenes portrayed in these words of the Prophet Joseph Smith will be satisfied. He says the persecution will follow the Saints of God from city to city. Was that fulfilled as the early saints were driven from Missouri and Nauvoo? I suspect that it refers to a yet future day. We know that the gospel must be preached in all the world. Obviously, it has not yet reached China and the Middle East counties to the extent that it has in the Americas, Europe and the “Islands of the sea.” The Lord will escalate the work of spreading the gospel to those nations in these last days through miraculous means. Part of that miracle is the Internet. I am convinced that many will be converted by what they find on the web. There are many who are filled with doom and gloom. They predict the end of civilization as we know it any day now. The headlines scream of the impending collapse of our economic infrastructure as well as the demise of our ecological environment. Could these be the false prophets that the Lord warned us against in Joseph Smith – Matthew? I am more concerned about the love of men waxing cold and iniquity abounding than I am with the economic ruin and environmental disaster that is the hue and cry of the day. There is not much you and I can do about the events of the world around us. What we can do something about is our own preparation for the return of the Savior and the end of the world or the destruction of the wicked. Let us treasure up the word of the Lord in our hearts and seek to live in humility and obedience to the commandments given that we may live in peace and harmony in our homes and be prepared for events of the last days. You must have returned from vacation. If so, welcome back. I think most Latter-day teachings have suggested that we can shape our destiny. I know that we must build the kingdom prior to the second coming, but I sometime wonder whether we are doing a good enough job. Indeed we have returned from our Pilgrimage of the land of Carol's forbears - generations of faithful pioneer ancestors - who settled Paradise and Mantua. Descendants in the thousands now mainly populate Brigham City - our home away from home when we visit lovely Deseret. We build the kingdom by our efforts to magnify our callings, faithful caring for those entrusted to us and by being very clear that stand on the Lord's side in what we choose to share on our blogs. I remain convinced that we are just seeing the very beginning of a great electronic outreach to the rest of the world. I think that love will also grow. We have to choose. I am trying to do something about that in my own small way on my blog The City of Enoch. Thanks for the chance to reflect on the time we are in. I enjoyed your blogs, especially the City of Enoch. My niece, who graduated from USC a year or two ago, decided to make a difference by serving in the Peace Corps in Bulgaria. What an amazing girl. She blogs monthly about her adventures for her family to read.